Setting up the hardware for APT reception is simplicity itself. The audio output from the receiver connects with the microphone socket on your PC soundcard, and the antenna is attached to the appropriate connector on the back of the receiver. The diagram opposite illustrates this. Many users nowadays use a low specification laptop computer fitted with a soundcard for this purpose. This adds flexibility, and allows the user to indulge in 'location' satellite imaging - either to escape interference from pager interference by escaping from the city or to continue pursuing the hobby when on vacation. First-timers users often stumble on their first attempt at APT imaging for the simple reason that their soundcard has not been primed to record audio signals. Consequently, although they hear the NOAA 'tick-tock' signal emanating from the speaker on their receiver, images fail to build up on their PC. This situation is nearly always the result of an unconfigured soundcard. By default, newly installed PC soundcards are configured to playing back audio signals from the microphone input, and from CD's, through the PC speakers but the card’s recording mode is not yet active. To achieve this you may require the utility program Sndvol32.exe which lurks in your PC's Windows folder. If you are unsure where to find this, click on your PC's START button and select 'Find'. Type Sndvol32 in the 'Named:' field, set 'Look in:' to drive C:, then click the 'Find Now' button. When the filename Sndvol32.exe appears in the browser window, double-click on it to open it. Sndvol32 first appears with the words 'Volume Control' in its title-bar. Click its Options menu, followed by Properties to reveal the properties screen. Click the Recording radio-button, make sure that the microphone option is ticked in the 'Show the following volume controls:' browser, then click OK to reveal the Recording Control panel. 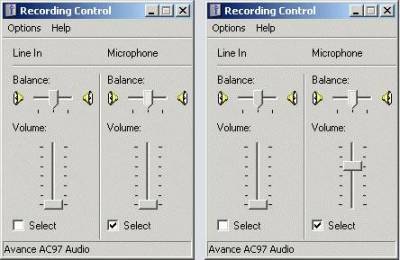 The illustration above shows the soundcard recording control with the line-in input muted (left) and active (right). You will most likely record through the microphone input jack so checking the Select box in the Line balance: panel, then raise the appropriate volume control slider to mid-scale. Depending on the input levels to your soundcard, you may find you obtain better performance and results using (and activating) the microphone input channel instead. The most popular entry-level software for soundcard decoding is Christian Bock's Wxsat. It is certainly not the most sophisticated of the software packages available but it is generally the most satisfying for the beginner because it displays the satellite images, line by line, in real-time as the signal is decoded. Wxsat's one main disadvantage is that obtaining the best results requires considerable parameter tweaking on the part of the user. The current version, Wxsat v 2.59 comes with a huge Help file which includes both copious text and screen images. There is a detailed tutorial on using this program here.